Why restrict your grape leaf stuffing to rice alone? 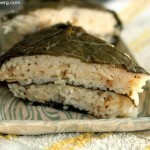 Rice or other grains are traditionally the base for many a stuffed grape leaf, perhaps because they swell up during cooking to make the leaf dumpling round, fat and firm. But that’s no reason not to expand into more unusual territory. Cheese, for instance. I got the initial idea for this recipe — if you could call two ingredients a recipe — from a restaurant in Bat Shlomo, which serves cold grape leaves wrapped around a firm labaneh. Call me immodest, but I have to say that my version is way better — there’s no cold cheese that can compare to warm, gooey mozzarella. I’d know, since I probably ate about half of my grape leaves while photographing them. Unlike rice fillings, the cheese doesn’t need to cook — and probably shouldn’t be cooked — for nearly as long as the grape leaves. So the grape leaves get cooked first. Once they’re soft, then you stuff them with the cheese(s) of your choosing. At this point, you have something that could be served, but if you’re working with a cheese that’s better once heated, stick the grape leaves into a baking dish, cover it, and plonk it into the oven. Until the cheese is soft, and the house is full of the irresistible odor of baking cheese. 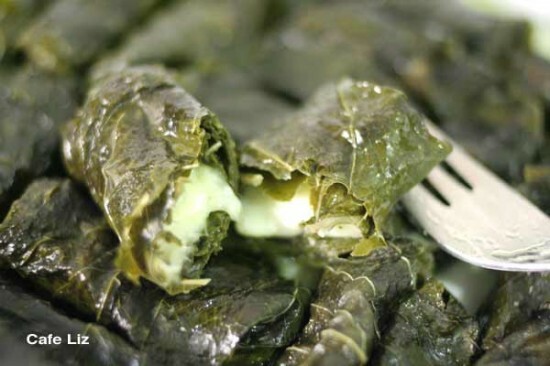 I filled my grape leaves with mozzarella plus a sliver of Arab-style sheep cheese known as jibneh, to add a more dominant flavor. I also made a few with tsfatit, a creamy, unaged white cheese, plus ketsah (a.k.a. nigella or black cumin) and parsley. Both were excellent. Tsfatit, by the way, is a mild, unaged white cow’s milk cheese named after the city of Safed (Tsfat in Hebrew). It’s about as firm as tofu, mostly unsalted and creamy tasting. Rinse the grape leaves, put them in a pot, cover them with water and boil them until soft — either 1 1/2 hours in a regular pot, or 1/2 an hour in a pressure cooker. Let them cool until you can touch them. Rip or cut the cheese into strips no thicker than your pinky, and a bit shorter. Stuff the leaves one at a time — take a leaf, lay it down vein-side up, stem away from you. Put a strip of filling next to the leaf stem, fold over the two lobes past the stem, then the sides, and then roll the leaf up around itself and the filling. (See the four steps depicted in the photo). 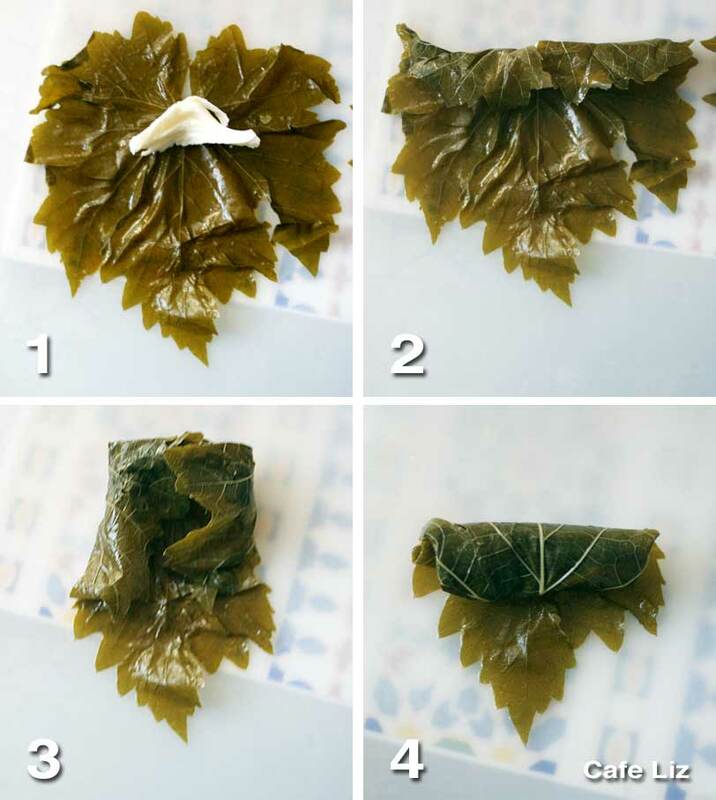 At this point, you have a few options: You can eat the grape leaves as is, microwave them for a few minutes so that the cheese is gooey and the leaves stay soft, or bake them so that the cheese browns slightly and the leaves turn a bit crunchy. To bake, arrange the filled grape leaves in a baking dish, add a small drizzle of olive oil, cover and bake at 180 degrees Celsius (350 Fahrenheit) until the leaves are heated through and the cheese has melted. I left mine in the oven for 30-40 minutes, but it doesn’t need to be in there that long. Serve hot. 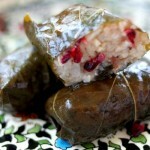 11 Responses to "Grape leaves stuffed with mozzarella and sheep cheese"
Cooking with grape leaves: What a great delicacy! Here in Western Europe it isn’t easy to get canned grape leaves everywhere so preparing fresh leaves is much better. The ideas with the cheese and the black cumin are brilliant. Glad you like it, what kind of fresh leaves do you use instead? Oh that looks so yummy! 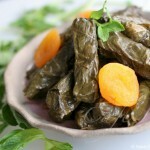 Where in the Tel Aviv area do you find fresh grape leaves? You won’t find fresh grape leaves now, their season starts in spring. The first leaves in spring that are still soft are the best says my granny. Yes, I used cured grape leaves, which I buy by weight from my olive guy at the shook. I compared fresh grape leaves with cured grape leaves in my post last spring, and I personally found that after you cook them for 1.5 hours, there wasn’t much of a difference. This looks very very good and very tasety! I am very pleased to see a recipe for using grape leaves – I live in Southern California and have grape vines so I am always wondering what to do with them. I will definitely try the cheese stuffed ones. They look wonderful! I always thought it would be too hard to work with them but you make it seem easy.